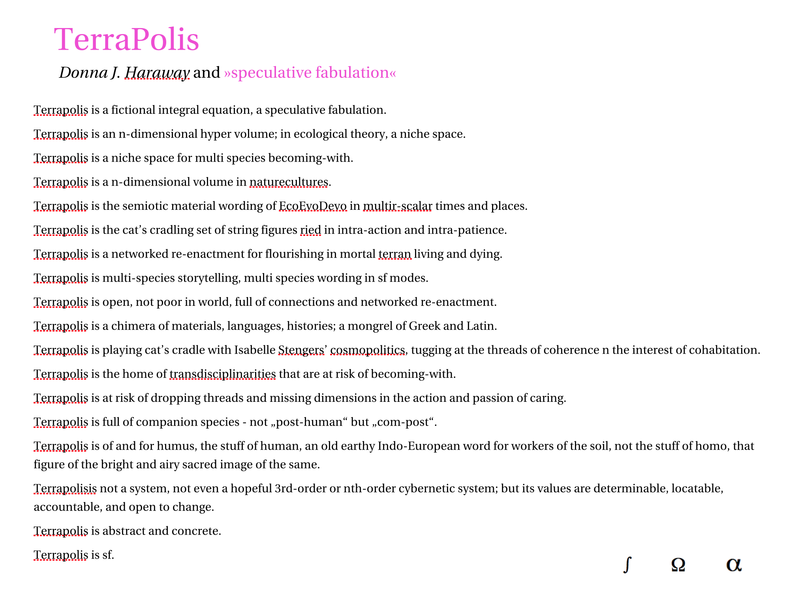 lecture manuscript, held at the Seminar Materialism without Territory, Art and the Environment, organized by the applied virtuality theory-lab at CAAD ETH Zurich, May 29/30, at the Cabaret Voltaire in Zurich. In terms of literacy, people can be so more or less, it is not an absolute term. This is different for calculability – we tend to feel that something is either calculable or not. To say that computation may be seen as a literacy means to say that calculation too cannot be regarded as an absolute term. Someone who makes sense in what they say does not necessarily speak the truth. The extension of sense (inclusion of falsity and truth) must be larger than that of knowledge (exclusion of the false from the true). It is from this gap between both that learning is possible, and that new knowledge can be constituted on the basis of sense. Yet how to think about such a notion of “sense”, and why should we dare to reconsider well-established cultural techniques so fundamentally? It seems as if t he limits of the representational paradigm for current notions of knowledge is being challenged by another one which we might simply call that of sustainability. How could we frame this emerging paradigm? We might think of it by conceiving of literacy in a mutually reciprocal relation to calculation. Neither one can be assumed to be absolute, and yet both are determinable within the constraints they mutually impose upon each other. What would this entail? One is dealing with letters of an alphabet, a finite and ordered set of elements each of which has a double make up: a letter embodies a quantity – usually we call it a phoneme, the body of a sound – and the graphemes, the Gestalten of the signs which are capable of expressing the bodies of sound in such an orthogonally governed manner that they form complex units of meaning. The other is dealing with numbers, which are like the signs of the alphabet meant to express bodies of quantities such that they may form, in a well governed manner, complex units. Yet with calculation, the manner of governing is not orthogonal (vertically oriented) but permeable (horizontally oriented) – everything variably factors in one another, as well as in the whole. From a different angle we are well familiar with these difference, we relate calculation to an economical order, and literacy to an order of political organization. Let us make this more concrete by thinking with this image about the themes of sustainability. First of all, we link the term up in a pair by coupling it with environment. A logics of the planet‘s oikos is challenged to formulate an identity notion – that of the earth together with its environment – that does not exclude circularity from the manner in which its definition is constituted: the environment is literally that which circum-gives the Earth, and which somehow is thought to be an effect of how the planet’s oikos, whose stocks are riches that regenerate themselves in cycles, exchange information between the compartments that together make up, somehow, the whole Earth – including what circum-gives and protects it, the environment. Such communication between the compartments, I want to suggest, is a question of how different magnitudes, of which we don’t know how they behave proportionally in relation to each other, factor in together in the environment. Sustainability is all about how the Earth, and its Environment, can manage well together. In order to learn about sustainability in terms of geometry, we have to think of the circle in both its aspects – its perimeter and its area, and this in a temporalized relation that must be characterized as “quick”, “alive” or “self-maintaining”. 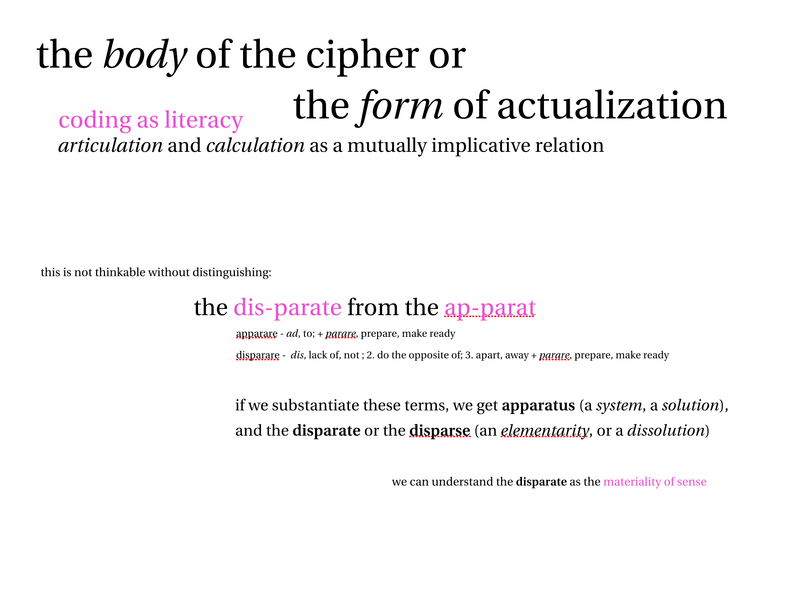 Thus, if neither one, literacy or calculation, can be considered as absolute, if both are determinable within the constraints they mutually impose upon each other, how might we tackle this entailment that urges us to engage – somehow – critically with circularity? We can look to algebra, that part of mathematics which affords the “unification of broken parts”, as its name literally suggests. It is crucial that by characterizing algebra in this manner, we are NOT thinking that “nature IS algebraic”. We are in the realm of SYMBOLICAL STAGINGS. So then, lets see what the Stanford Encyclopedia of Philosophy states, that algebra can do, on this stage for symbolization: algebra provides ways of managing the infinite. 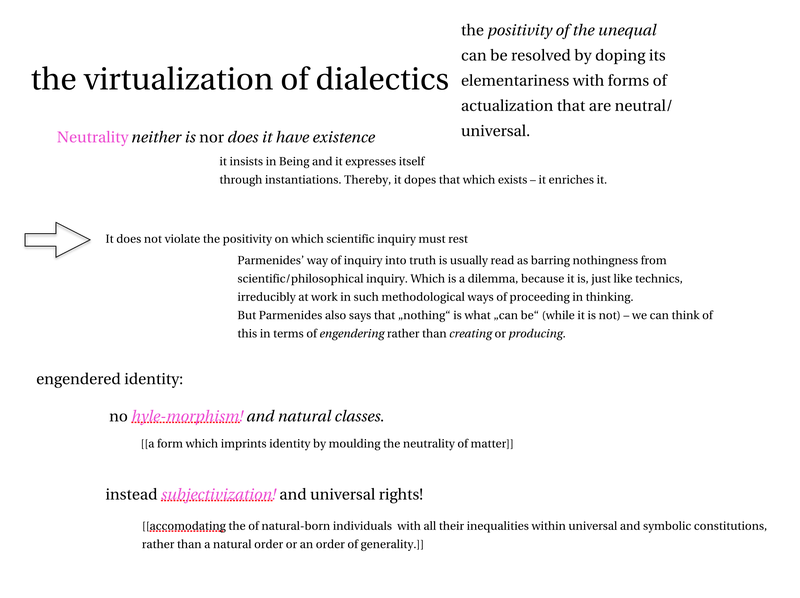 Let me clarify how I want to make sense of this: We are on a symbolical stage (in conceptual “reality”) and we have Riches to be harvested and cultivated, by technics and by formal thinking which makes the cultivation possible as something which can be “communicated”. Thus, I would place such “algebraicness”, the stages it provides, as the ARCHITECTONICS and the RICHES OF THE UNIVERSE as the infinite which is being MANAGED by the structures of the architectonics. Thus, I would argue that it is not adequate to think about the symbolic structures and operators from the dipolar level of ontology and epistemology. This dipolar level, I would like to think, is enveloped within a comprehensive ARCHITECTONICS. There can be many such Architectonics, each producing particular epistemologies and ontologies. These Architectonics are how we settle, intellectually, on the world as a place in the universe. With it, we settle intellectually within the vastness of the universe. In the history of mathematics, there is a long tradition of thinking of the infinite through the figure of the circle. The circle has been thought of as an expression of the infinite because it can never exhaustively be measured. Algebra provides ways of managing the infinite according to methods of measuring the circle either by triangulation or by squaring. With triangulation we are operating algebraically in arithmetics, we partition and differentiate the circle’s area. With squaring, we are operating algebraically in geometry and construct proportionalities that allow for approximating the length of the circles perimeter. The ways of managing that algebra is capable of providing, capture the data rendered by these ways of operating (triangulating and squaring, and collecting the results in tables) into generic formulations. I call it generic because Algebra expresses its statements in terms of signs that envelop the quantitative bodies in an evaluative manner – as values. We have in algebra, perhaps in algebra alone, an intermediate level of notational code and ciphering between “signs” and what they indicate. This intermediate level is introduced because algebra operates in symmetries: whatever a formula expresses produces a mapping (a function), but not one that stands for something else, a representation. It produces mappings that can stand in for that which has been articulated in a formula. These mappings can stand in for their own “original” so to speak – that is, they can articulate “the original” in a tautological manner – and this needs not be seen as an absurdity, it is rather a manner of how Originality can be continuing itself, as originality. The mappings produced by formula (an EQUATION) are varying expressions of one and the same thing. They can be such if only we affirm that neither expression is ever capable of “expressing all that is to it at once”. In other words: that which is expressed is of a vaster extension than any one of its symbolical expressions can ever be. In logics and in mathematics such peculiar, self-same mappings are called „impredicative“. Impredicativity concerns self-referencing definitions that build on what they antedate. In a standard and symbolico-technical formulation from analytical philosophy, impredicativity is related to the so-called vicious circle principle: it is impossible to define a collection S by a condition that implicitly refers to S itself. A definition is said to be impredicative if it invokes (mentions or quantifies over) the set being defined, or (more commonly) another set which contains the set being defined. One can easily see the relevance of this for any earth science, whose point is exactly that all distinguishable „compartments“ that together make up the planet involve such definitions. These problems with regard to the stating of a definition are intimately related to the representational paradigm. It appears questionable whether they are to be weighted in the same manner within a paradigm that seeks to make sense in terms of sustainablity, meant as “capable of being continued”. It appears as if an embrace of just such circularity is the way of learning to think “sustainably”. Without such an impredicative space of self-same transformability – what i would call a symbolical body of reciprocity, a stage on which we settle into a certain ordinariness in our thinking – no code can operate as a code. (We’d not be aware of the symbolic make up of our “ordinariness”). A code deals with values, within a systematical context that is closed upon itself. This is different for signs. They appear when such self-same symmetry is broken (when something breaks into the ordinariness we got used to in our Stage). When something factors in that had not been taken into account. When the self-maintaining balance is disturbed. So how can we think the relation between code and sign while appreciating both? This is the background context of my talk. 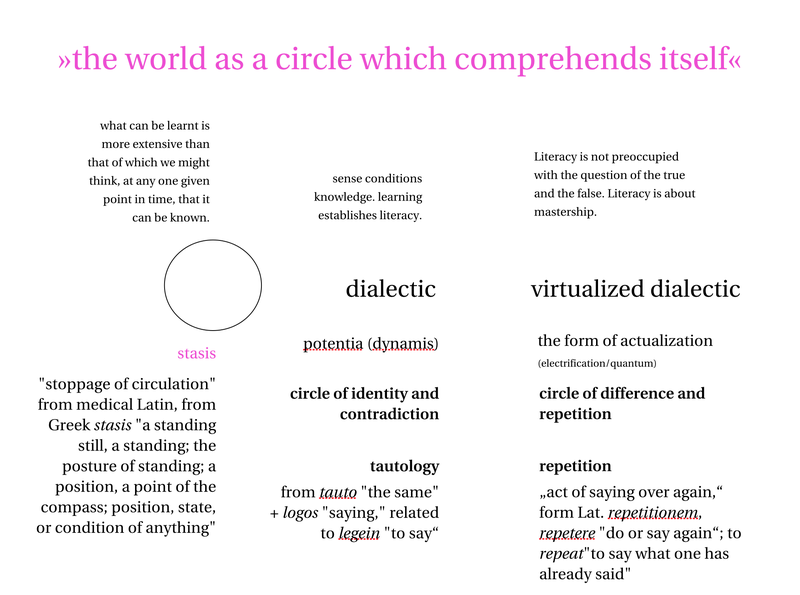 It is what I hope to get clearer about with learning to understand what it entails to reciprocally relate articulation to calculation as two mutually constitutive realms of reasoning that is, essentially, circular. (3) Subjectivization and a Philosophical Grammar of Quantity One first distinction we should attend to regards the relation between quantity, quality, and equality. We are told by Aristotle (Cat. vi 6a27) that what is most characteristic of quantities is the attribution to them of equality and inequality. For him, to speak of equality in terms of qualitative aspects didn’t make any sense. This is indeed what demarcates his philosophy as a realism – for him there are natural individuals, not natural kinds as for Plato: Aristotle gives primacy to the individual. It alone can be qualified, through specification, and through unifying species into genera. The qualitative was to be specified, and characterized according to how individual entities embody those qualities. Thus, it was the quantitative alone that was referred to the universal, and hence could be treated in terms of “equalities”. The qualitative was referred to the individual, and it needed to be distinguished according to species and genera. But a notion of a things “identity” can only be gained (in a philosophical, scientific way) by formulating it – i.e. by finding an “algebraic expression” for it. With regard to algebraic formula, however, this separation between 1) the universal and quantitative, and 2) the individual and qualitative, becomes complicated to sort out. Because here, the distinction between ratio and quantity is crucial, and the notion of ratio, as we have already seen in other talks, means proportionality between “natural kinds”. This poses the problem of all realist stances in philosophy – how to gain a notion of natural kinship. Ratios figured only in the framework of a formula (an equation), within which they are proportionality established between the terms that are being set “equal”. We can easily see in the schema of a proportion, A : B = C : D, that the distinguished terms are treated as quantities, whereas the sides right and left of the equation sign is treated as ratios. The cunning involved in algebraic reasoning consists in allowing one quantity to be unknown (or more than one, in more complex systems of equations), and to establish procedures of determining it according to (within the confines of) a proportional framework. The incomplete proportion x : B = C : D makes the assumption that x must be a value of A, and on the basis of this assumption, algebraic reasoning proceeds by factoring out the terms into several equations and linking them up into a system of equations that co-constitute a solution space. In other words, the cunning in algebraic reasoning involves dealing with both, quantity and ratio, via recourse to a third and mediating notion, that of value. And values apply to both, qualities and quantities, or rather: they apply to qualities insofar as they are measured in order to expose similarities between the individuals (and thus allow for speciation, generalization). Values, we can say, arise from the interplay between logics and geometry, ratios (and their logical analog proportion) and quantities (each made up of magnitude and multitude). Values are what mediates this very interplay. Why is this important? Because it is through this mediating notion of “value” that “identity” comes into play, is being temporalized and through that coupled with a level of “individuality”, and through that, “equality” has to be distinguished from “sameness”. To decipher these differences, we need to recall a further distinction that was crucial for all of mathematics until the advent of conceptual mathematics with set theory, namely that between magnitude and multitude. Magnitudes answer to questions of how much?, and they require a metrical measure that is specific, a means common to the different kinds of magnitudes; multitudes, on the other hand, answer to the question how many?, and they are assumed to reign universally. In other words, multitudes are held to count and govern magnitudes. In a recent article entitled „Eudoxos and Dedekind: on the ancient Greek theory of ratios and its relation to modern mathematics“ Howard Stein elaborates that the difference between magnitude and multitude „is quite alien to our present way of thinking about such matters, for us, to say that two distinct triangles are equal in area is to say that they have ,the same area‘.“ His argument is that in Antiquity quantity was a category for which an entire philosophical grammar existed. It is this grammar that the thinking in terms of ratio (proportionality, analogicity, logics) would apply – thus, there is an intermediate level between the registered or recorded quantities and their physical referents. Today, this intermediate level is nor usually evoked. It plays in whenever we try to be differentiated with regard to local and global properties and their relations. But overall, we have come to treat both, magnitude and multitude, as particulars that are governed conceptually (as finite sets). And these concepts are not thought of anymore as grammatical (which would place them in literacy), but as strictly formal and logic. What used to be a grammar for articulating quantities has thereby turned into a logics – with that, we have made a step from what may be called natural mathematics in distinction to conceptual mathematics. We can easily see the relevance of this for our interest in literacy: while grammar enables literacy in the comprehensive sense, logics seeks to strip literacy’s extension of that which makes sense from the false, and to purify what is to legitimately make sense from all suggestiveness of eloquence in expression. According to the philosophical grammar, where no such conceptual logics was available, Stein says: „it would be incorrect to speak of ,the area of this triangle‘” because “a triangle does not have an area, it is an area – that is, a finite surface”. According to the philosophical grammar of quantity, “this area means this figure, and the two distinct triangles are two different, but equal, areas.“ His point is that within such a grammar, entities are universal in their nature, whereas with the shift to conceptual mathematics, entities havea universal nature. So I am nor arguing that the “grammar” is something we have lost and should regain, with out emphasis on “conceptual logics”. Because it is only with the abstraction from words of grammar onto a formal level that we can address the question of how Values factor in, in how “equality” is established. Once we take values into account, we would not seek to identify “equality”, rather we are speaking of “equivalence”. We become aware that in our “grammar of quantity “ we are in a formulaic space. Our problem today is that we think this formality is Universal, or at least uniformally Existent. It is here that the Sheaf and Category way of thinking in formal concepts appears to interesting to me. But lets stay with the grammar of quantity more closely and see more how can we imagine it (as something different from quantified formal concepts) – in order to think about how we might think of “quantized” formal concepts. So, a grammar of quantities. We can regard multitudes like the VERBS that take nouns or pronouns as their transitive objects, upon which they exert the activity they incorporate. Magnitudes, within this analogy, can be regarded like the transitive OBJECTS of the multitudes(VERBS). Let us take this analogy as a kind of “auxiliary construction”, and put some more stress to it: we can see that multitudes occupy the role of verbs, and magnitudes that of objects, but with regard to the subject position – the voice of mathematical articulation – the two notions that together make up “quantity” is indeterminate. That is, its position is left blank. My point is that it is the role associated with the subject position that is acted out by the genuinely mediating notion of values. In other words, the values, in their acting out, individualize the subject But how can we say they are mediating? Mediation needs at least some sort of “substrate” on which it can act (information, energy, ether or whatever). In the case of our quantitative grammar, the position of the subject is void – subjectivity is acted out in the absence of a unified identifiable actor. My point is that we take this “absence” as something to work with. We can understand it as “dedicated place for something to actualize”. We can conceive of this mediation as the peculiar contribution of algebraic forms, that is of equations, and their capacity to express “identity” inversely. And we can conceive of such algebraic identity as the symbolic establishment of a tautological relation that characterizes neutrality, encoded as a cipher. A cipher has a transcendent referent, yet its power consists in “presenting” this transcendent referent symbolically while leaving it absent, just like words are capable of evocating something absent into presence. We can regard a cipher as a symbolical body of a self-referential relation whose identity is being articulated, not represented. I call it a body because we must think of it as a relation that can be organized corresponding to a particular codes, their inventories and rules. If equations are not considered in terms what they might “represent” in a world conceived to be exterior to it, but in terms of what they articulate and express through partitionings extracted out of that formalities own interiority. Such articulated formality cannot be separated from the characters and rules used in the applied notation systems. 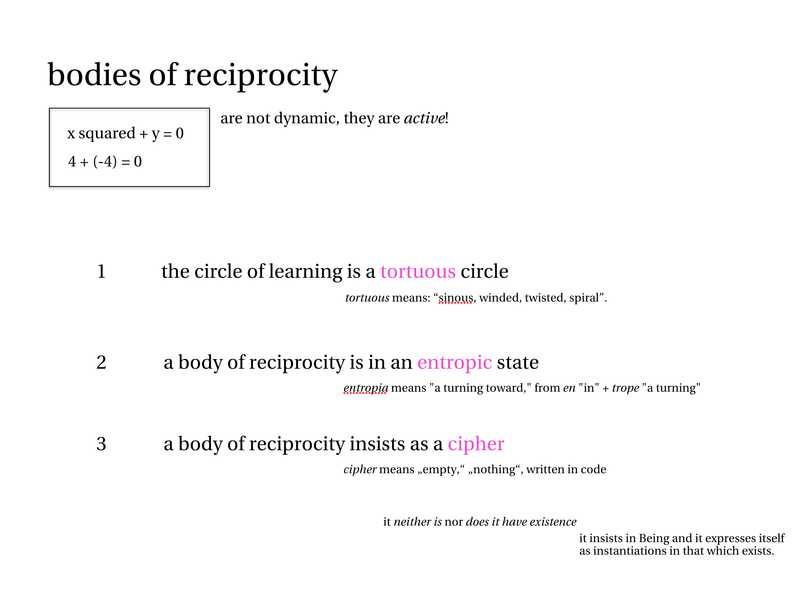 Hence, we can think of a cipher, together with a particular code in terms of which we can decipher it, as a virtual body of reciprocity. Such a virtual body cannot be addressed in terms of equality, it must pay tribute to the equivalence that establishes it symbolically. The “identity” is an actor on stage. Hence we have, with this perspective, gained a distinction with regard to how we can think of “identity” – we can speak of equality with regard to the actuality (verbs) and object positions that are affected by such actuality, and we can speak of sameness with regard to the virtuality of the subject position. the “identity” an equation expresses, then, is doubled-up into a complementary (mutually implicative) interplay between its factuality, objectivity, and subjectivity – all three of which must be conceived of as in the infinite tense. (4) The alphabetization of number: the cipher, and its quantum-bodies of objective neutrality (because they did not yet subjectify) An alphabetization of number means to decouple numbers from the apparent sequentiality that constitutes the Induction Principle in Arithmetics, and instead to treat them like the letters of an alphabet. In a text, the appearance of a B does not necessarily follow an A, as it would according to the positional system within the alphabet. Instead it can just as well precede, lets say, an E in order to form the word BE. Of course, with this analogy I do not mean that numbers might be compassed by the alphabets of languages as we treat them in (mainstream, structural and transformational) linguistics. Rather, we might say that the elements of language and the elements of arithmetics belong together within a third, and this third is symbolicity as a quasi-material elementarity which is governed by Laws, in distinction to the logicist idea of it as a symbolic Order that is stateable by Laws. In any case, we would be mistaken, or at least acting prematurely, if we reduced our speaking of the alphabetization of number to a merely metaphorical usage; indeed, it is the essence of coding to establish finite and symbolical alphabets, within which the place-value logics of natural numbers (as we have it for example in the decimal number system) is combined with the mathematical notion of information in terms of quantities that can thus be positioned within a numerical space. In information science information is not, like we would expect from linguistics, semantically or materially determined (e.g. nuclei of meaning, or the phoneme as the basic element of sound). Instead it is a strictly symbolical notion, which is determined by taking a symbolization of chance as its quasi-material, or quasi-semantic „magnitude“ – magnitude because in such symbolizations, chance is counted by an indefinitely stated, yet finite variable (the so-called „chance-variable“), whose values sum up all the combinations possible for the elements of the coding-alphabet. This is what renders chance measurable. All probabilistic procedures depend upon such alphabets. (If I am not mistaken). It is with their help that algebra manages the infinite today in manners as yet unseen._ Yet from a philosophical point of view, the meaning of this characterization of algebra entirely depends upon our notion of the infinite – do we mean, by the infinite, only what we can account for by enumeration, i.e. in regard to number, or do we mean, by the infinite, also what we can learn to account for by qualitative specification of that which we can, symbolically, enumerate as entities, i.e. in regard to the modularization form, and that which gives measure. From the literature on mathematical practice, the common assumption today seems to be the former. On this assumption, the status of algebra in what we can know is subordinated and instrumental. Algebra, according to this understanding, can only be applied to what is assumed to be identical in its kind by nature, independent of how we think about it. Algebra in this understanding can help us to find out how what is identical in kind, and hence potentially determinable, can actually be determined through reason. According to the latter characterization of the infinite, on the other hand, identity itself is the nature that is engendered by the contracts worked out with symbolical procedures. A thing‘s determinability, here, is not independent from the thinking that appropriates and develops the skills of actually determining it on reasonable grounds. The status of algebra according to this latter view is not only instrumental in how we can learn to know, but also constitutive for what we can learn to know. [[ The universal then, in this second perspective, is not the kind in which everything is common (classical understanding: the universal is that which is the property of every thing) – but it is that which can be common to any thing. ((The universal as kind-ness)). ]] So let us sharpen this line of thought: our contemporary form of technics is algebraically constituted – electricity and information are both concepts with real and physical manifestations, even though they are formalized in terms of symbolical quantities. Both of these formalizations work by symbolizing their systematicity in terms of entropy. The concept of entropy originates in the science of dynamical systems, i.e. in thermodynamics._ Here, entropy is a measure of the number of specific ways in which a thermodynamic system may be arranged. Thermodynamic systems are systems constituted by an operative measure that acts upon a temporal happening, not by a particular design of a constructive order that would apply to a static constellation. Yet in order to still count as a system, i.e. in terms of a finite number of specific ways in which it can be arranged, thermodynamics must assume the state of an ideal balance for each system – what is called their state of maximum entropy. This state is an ideal state because it describes a state in which, paradoxically, nothing actually happens. As long as such a system can count as real, it never is in this ideal state. This ideal state is commonly called „disorderly“. Yet what is referred to in terms of „disorder“ here is ill understood if we conceive of it as chaotic in any genuine sense: such a state is not confused in the sense that it lacks determinability; quite oppositely, maximum entropy in fact denotes a state of too much determinability – namely the state where any way of arranging the system‘s course is equally likely to happen._ So entropy is a measure, and dynamical systems are dynamical because they are constituted not by one particular order, but a structure that supports the full operability of this measure. To picture what this means, we could say that the metrical constitution of these systems extends as the totality of all the orders that can be constituted by applying the measure. Maximum entropy, hence, would be the state of a system in which its constitutive measure measures nothing but itself. The ideal state of maximal entropy is like an impredicative definition in logics, i.e. a definition that is self-referentially defined. Hence, the thermodynamic idea inverses the scheme of how philosophy has traditionally thought about order and disorder._ Here, ideality is not linked to pure order, and reality is not linked to deficient and confused order, but the other way around. Ideality is disorder because it is a too much in possibilities, a system is the more real the less ideality characterizes it. In other words, a system whose dynamics unfolds in approximatively uniform manner counts as a “well-ordered” system, whereas one which remains difficult to predict in its behavior counts as a “disordered” system. Noise is actually the amphibolic milieu in which a signal will trigger effects. There are interesting links here to Simondon’s theory of individuation – in a way that would lift his “emphasis” on physical instruments and apparatus (their “mode of existence”) to the level of the symbolic schemes and forms that constitute their mechanical workings. The concept of entropy has been introduced early in the rise of thermodynamics (it is already stated in the first law), but at first it merely played a theoretical and postulational role, its assumption was necessary for accounting how a thermodynamical system can conserve energy (however asymmetrically). It was only with a formula that assumed the number of ways in which the energy of a system may be distributed to its parts can be identified globally, for all thermodynamic systems, as a constant. With this formula, Ludwig Bolzmann introduced a way of how the particular entropy of a system could actually be determined in predicative (not in self-referential and impredicative) terms._ This inverted set-up in thinking about order and disorder is constitutive for how the entropy concept has been appropriated in information science. In the mathematical theory of communication, a message is considered within a probabilistic framework, analogous to how thermodynamical systems are regarded in nature. In communication technology, the technological pendant to “nature” in thermodynamics is the “channel”. Here, entropy also counts as a measure of disorder, i.e. 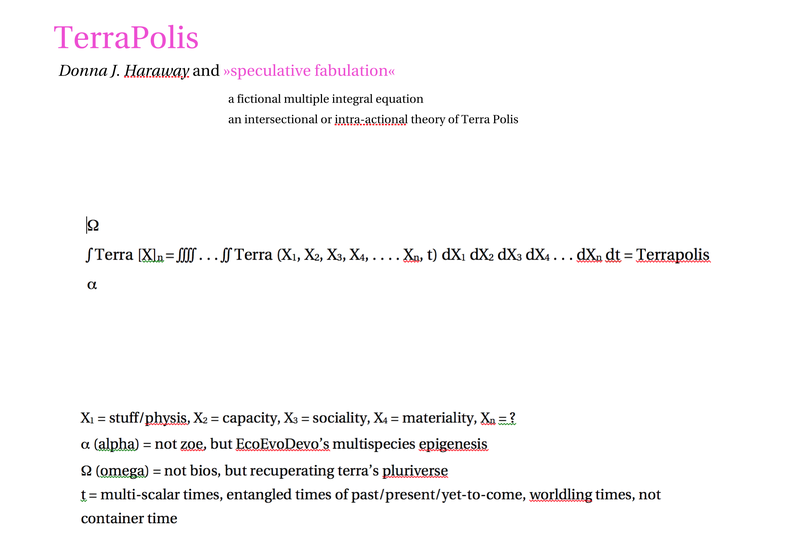 as an excess in ways of how the structure of the message (conceived as a dynamical system) might be arranged. Thus, from the point of view of communication technology, this line of reasoning results in the following proportionality: The higher the entropy with which a message arrives at the destination of its transmission through a channel, the higher the amount of information involved in the act of communication. It was the genius of Claude Shannon to find a formula for statistically determining the value of entropy in informational systems analog to that found by Bolzmann. With recourse to George Boole‘s binary algebra, and through applying Boole‘s notational code not to the consistency of logical arguments (this is what Boole himself applied his algebra to_) but to the conductivity of electricity, he was able to introduce a binary unit of information, the BIT, and hence think about the transmission of messages „mathematically“. As a unit, the BIT is conceived such that it is thought to count a magnitude; yet this magnitude is entirely pre-specific. It is Chance rendered measurable by having it articulatable by a particular alphabet (whose possible articulations sum up to the symbolical totality of a chance variable). Such a magnitude is pre-specific not only because it represents the continuity of a magnitude in discrete manner, but also because the kinds of the magnitudes which the BIT discretizes are relative to a finite alphabet of coding, the sum of whose elements constitutes the „horizon of events“ which operates, in probabilistics, as the particular magnitude‘s form. This horizon of events is a so-called „chance variable“. Hence, from the point of view of communication technology, anything at all can count as a „message“ as long as it can be encoded within the finite characters of an alphabet (morse code, color code, musical scores, the laws of kinetics, those of dynamics, those of quantum states, the table of chemical elements, elements of DNA, etc)._ We can see where the initial and ingenious analogy between nature and a particular probabilistic framework gives rise, meanwhile, to all the confusions regarding the not-strictly technical status of the concept of information: Information technology renders plainly evident that the „nature“ of any probabilistic framework is a symbolically contracted nature. Therefore, the particular status of the symbolical in probabilistic reasoning has turned problematical: It is with regard to this peculiar status of the symbolic that our initial question regarding infinity matters so much: symbolical procedures are not only instrumental in how we can learn to know, but also constitutive for what we can learn to know. »The electron is a structureless point particle “dressed” with its intra-actions with virtual particles: it intra-acts with itself (and with other particles) through the mediated exchange of virtual particles. (For example, an electron may intra-act with itself through the exchange of a virtual photon, or some other virtual particle, and that virtual particle may further engage in other virtual intra-actions, and so on.) Not every intra-action is possible, but the number of possibilities is infinite. In fact, the energy-mass of this infinite number of virtual intra-actions makes an infinite contribution to the mass of the electron«. »Vacuums are on the razor edge of non/being. The void is a lively tension, a desiring orientation toward being/becoming. The vacuum is flush with yearning, bursting with innumerable imaginings of what could be. The quiet cacophony of different frequencies, pitches, tempos, melodies, noises, pentatonic scales, cries, blasts, sirens, sighs, syncopations, quarter tones, allegros, ragas, bebops, hiphops, whimpers, whines, screams, are threaded through the silence, ready to erupt, but simultaneously crosscut by a disruption, dissipating, dispersing the would-be sound into non/being, an indeterminate symphony of voices. The blank page teeming with the desires of would be traces of every symbol, equation, word, book, library, punctuation mark, vowel, diagram, scribble, inscription, graphic, letter, inkblot, as they yearn toward expression. A jubilation of emptiness. Don’t for a minute think that there are no material effects of yearning and imagining. Virtual particles are experimenting with the im/possibilities of non/being, but that doesn’t mean they aren’t real, on the contrary. Consider this recent headline: “It’s Confirmed: MatterIs Merely Vacuum Fluctuations.” The article explains that most of the mass of protons and neutrons (which constitute the nucleus and therefore the bulk of an atom) is due not to its constituent particles (the quarks), which only account for 1 percent of its mass, but rather to contributions from virtual particles. Let’s try to understand this better”«. 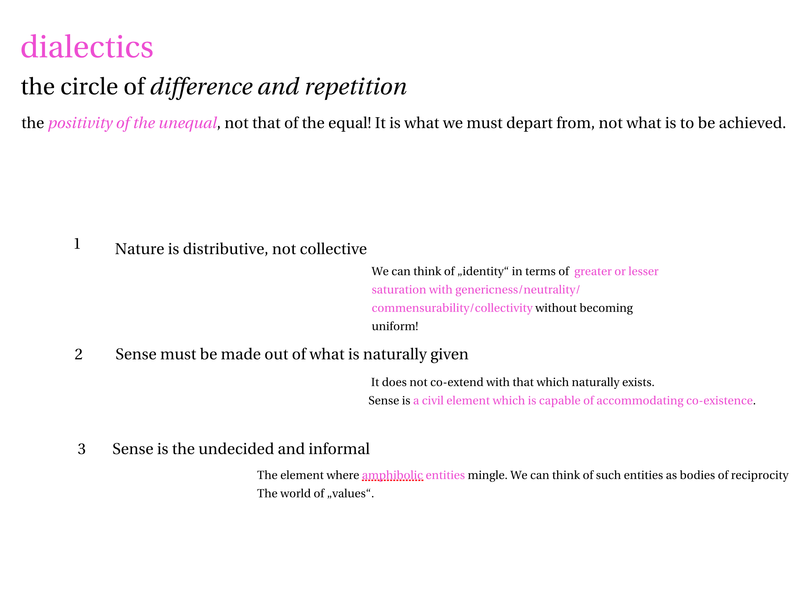 Gilles Deleuze, Difference and Repetition S. 57. 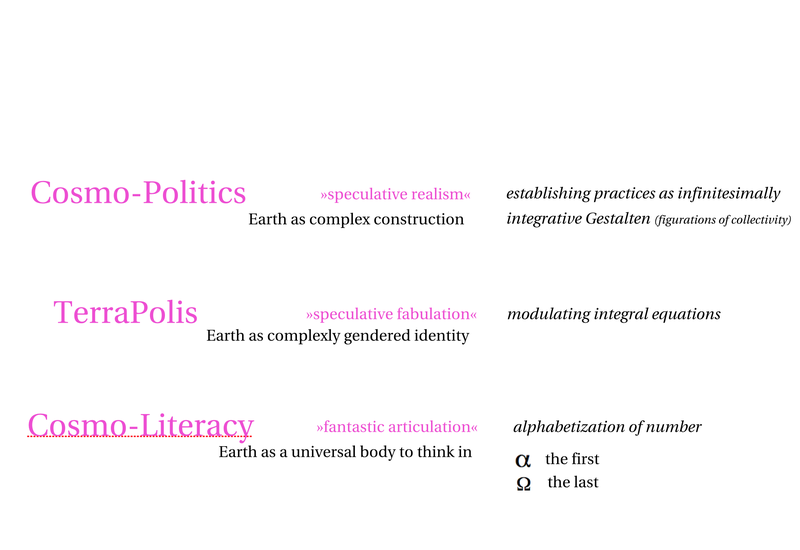 Tags: alphabetization of number, bodies of reciprocity, bodies-to-think-in, cipher, constitution of objectivity, dialectics, Donna J. Haraway, Gilles Deleuze, Karen Barad, le dispars, materialism of sense, neutrality, nothing, nothingness, quantum bodies, quantum subjectivity, sense as an elementarily, symbolicalness, symmetry, TerraPolis, the positivity of the unequal, virtualization of dialectics, zero. Bookmark the permalink. Previous post ← The reciprocal double-articulation of »sustainability« and »environmentality« or The mode of »insisting existence« proper to the circular.